Click here for an update of this report. A falling percentage of American households can afford to buy houses as prices rise and incomes fail to keep pace. Yet, the sale prices of existing housing keep inflating. According to the NAR, which publishes the median and average sale prices after sales have settled, the prices of existing houses rose by 4.7% year to year in May. This represents contract prices mostly as of March and April. The online real estate firm Redfin publishes data on sales contract prices virtually in real time from the MLS data for the largest and most active metropolitan areas in the US. Its data showed a year to year gain of 4.3% for contracts reached in May. While house price inflation may be slowing, it’s still too fast relative to US household incomes. The average weekly earnings of US workers has been rising at an average monthly rate of just 2% over the past year. With mortgage rates approximately stable year to year, housing is becoming less affordable as it continues to inflate. Both data sets show house prices increasing twice as fast as household incomes. To many owners of houses and to Wall Street economists, that’s “appreciation.” To everybody else, especially the 40% of households that don’t own a house, that’s inflation. The BLS and professional economists don’t recognize it as such, but it is what it is. Obviously the trend of declining affordability probably can’t end well for the housing industry, for the US economy, for current owners of houses, or for mortgage lenders, and ultimately for you and me. That’s because it is we, US taxpayers, who will end up bailing out Fannie and Freddie and the big banks again when the next price “adjustment” comes. 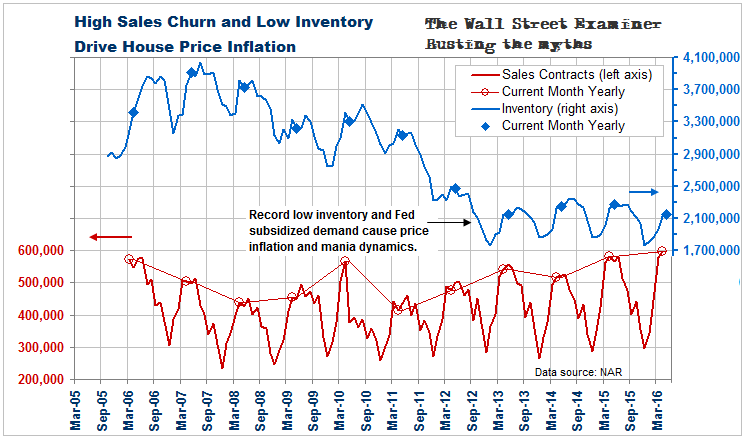 The Fed’s subsidy of super low interest rates directly promotes housing sales churn. That’s ok if supply rises to meet demand, but that’s not happening. The rate of sales is back to near record highs, above the levels of 2006 when the last bubble peaked, and nearly as much as the peak sales volume reached in 2005. That level was in a mania. I know because I sold my house in Florida in June of that year, just as sales volume was peaking. The market had gone crazy. It’s approaching a similar frenzy of activity today because one of the prime motivators of the buying is fear. It’s the fear of those who are on the income qualifying razor’s edge that they will be priced out of the market. This dynamic is particularly strong in tech bubble and Sunbelt markets. When have we seen this before? Whether local or national in scope, fear driven manias don’t end in a good place. Some local markets are being left in the dust, but enough markets have seen double digit gains, that it’s troublesome. According to Redfin, 7 large metropolitan markets saw year to year inflation of 9% or more. 11 more metros out of the 31 Redfin covers had increases of 5-9%. 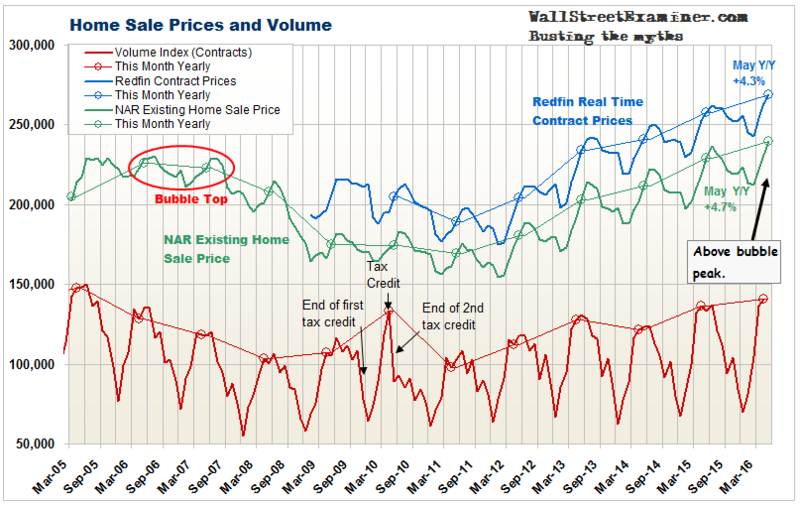 The dynamic that is stoking this mania is not only the Fed’s direct subsidy of buyers via super low mortgage rates. That encourages more buyers to bid, and bid more aggressively. 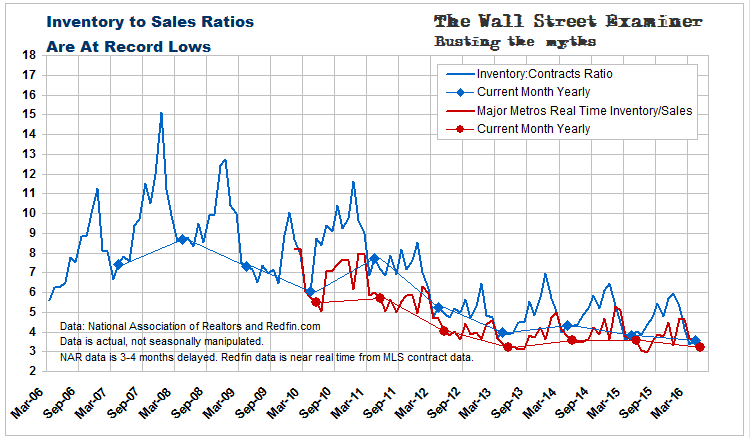 But low interest rates also suppress inventory. As the massive baby boom generation moves into retirement age, interest rates are so low that they have no incentive to cash out of their homes and move to rental properties or less expensive houses. So they stay in the housing market, either staying put in a house that’s too big for them or often holding on to the old house as a rental property. Finally, low interest rates encourage investors to buy houses as rental properties. That takes supply off the for-sale market. Because the opportunities to invest cash in alternative income producing investments are so limited, housing becomes a fat target for investors to use leverage to generate decent returns on their cash. Again, the Fed is directly promoting this by subsidizing low interest rates. Ironically, the idea of raising the rate that the Fed pays to the banks on reserve deposits, which Yellen and Co. have tabled for now, would only make the situation worse by lowering banks’ cost of funds. Raising the short term rate in that way would only force Treasury yields lower. Mortgage rates would go with them. Central bank sponsored negative interest rates in Europe and Japan are also driving capital out of those markets into the US seeking positive yields. This is suppressing US Treasury yields and the mortgage rates indexed to them, even more. The ECB and BoJ are actually promoting the US housing mania. It’s an unintended consequence of insane central bank policy. So we have an artificial market, with idiotic central bank policies artificially suppressing mortgage rates. Buying is driven by fear among prospective buyers, and by a lack of decent alternatives for would be sellers and investors. The same suppression of mortgage rates keeps supply off the market. Artificially stimulated demand and suppressed supply cause an unhealthy inflation in house prices that is pricing ever more potential owner-occupant buyers out of the market. A healthy housing market would be driven by a growing population with rising incomes and upward mobility. That’s not happening. The current trend can’t end well. The question is timing. We don’t know how long the clock will tick until the next crisis erupts. Whether you are a would-be owner occupant or a would-be investor in housing, “investing” in a house is becoming an ever more dangerous proposition.